In this Philippine name, the middle name or maternal family name is Apostol and the surname or paternal family name is Postigo. Julie Pearl Apostol Postigo (May 21, 1968 – May 6, 1985), better known by her stage name Julie Vega, was a Filipina child actress, singer and commercial model. She remains very popular in her native Philippines, years after her death at the peak of her career at age of 16. She won two FAMAS Awards for Best Child Actress during her brief showbiz. Named after her parents, Vega was born at the UERM in Quezon City, Philippines to a practicing Roman Catholic family and was the youngest and only girl in a brood of six children of dentists Julio Postigo (1931–1991) from Zamboanga del Sur and the former Perla Apostol (nicknamed Pearl, born 1932) from Iligan City. This fact led her family to nickname her Darling and Tata, which was given to her by her nanny Flor Argawanon and means "youngest child" in the Visayan language. Vega's older brothers are James, Jeffrey "Joey" (1960–1983), Jonathan "Noni", Joseph "Toti" and Jerry "Steve". Vega was discovered by film and stage director Lamberto Avellana and actress Boots Anson-Roa in 1975 while performing at a Christmas party at the Quezon Institute where her mother then worked, thus starting her career the following year at the age of six as a commercial model in television for Purefoods and Band-Aid. She first used the screen name Darling Postigo and appeared in her first film entitled Ang Pag-ibig Ko’y Huwag Mong Sukatin as the young daughter of Anson-Roa and Dante Rivero. It was not until she appeared in her first major lead and breakthrough role in the 1978 film Mga Mata ni Angelita that she started using the screen name Julie Vega upon the recommendation of film producer and director Larry Santiago, who owned Larry Santiago Productions which produced the film. She had been chosen to play the title role despite placing only third among over 200 applicants for the role. Aside from her work in Anna Liza, Vega also starred in several films and won two FAMAS acting awards overall. She won Best Child Actress for Mga Mata ni Angelita and Durugin si Totoy Bato and was nominated for Best Child Actress for Mga Basang Sisiw and Best Supporting Actress for Isang Bala Ka Lang!. When Vega became a teenager, she was signed to Regal Films by producer Lily Monteverde, who also owned the film company since its inception in 1962. She was then included among the so-called Regal “Cry Babies” along with then fellow teenaged actresses De Belen, Maricel Soriano, and Snooky Serna. She did a total of six films for Regal, including Where Love Has Gone, Mother Dear, To Mama with Love, and Daddy’s Little Darlings, all of which became certified box office hits. Aside from acting, Vega also became a successful singer in her own right. She initially refused to pursue a singing career of her own, but after repeated prodding from her older brother Joey, who noticed her beautiful singing voice, she finally consented to doing so. She took formal voice lessons under renowned songwriter Cecille Azarcon to further hone her singing voice. With the training she received, she was able to sing many of the theme songs of the movies she appeared in like Dear Mama, Where Love Has Gone, Don't Cry for Me Papa and Iiyak Ka Rin. It was during one of her singing promotions for Where Love Has Gone that Vega was discovered by Bong Carreon, who then offered her to be a recording artist for the then newly formed Emerald Recording Company owned by Carreon and his then wife, the famous Filipina singer Imelda Papin. Her debut single Somewhere In My Past, composed by Mon Del Rosario, was a major hit which became a certified gold record in only its first few weeks of release and would prove to be her most enduring hit and the one song she would be most identified with. The single’s success prompted Bong Carreon and Imelda Papin to launch Vega as a full-time solo artist by coming up with the latter’s 1985 debut album First Love, which included Somewhere In My Past and produced her further hit songs like Someone Special, The Memory Will Remain, and the title track itself. According to Vega, she particularly liked singing because it is through this medium that she is able to best express her inner thoughts and feelings. This became especially true after the loss of her brother Joey, to whom she was particularly very close. Joey was stabbed to death in a car by hired killers, who mistook him for another person they were hired to look for and then kill, while hanging out with his friends in 1983. His untimely death at the age of 22 proved to be devastating for the young Julie, who then repeatedly wished to join him in death. In spite of her hectic showbiz schedule, Vega was still able to attend to her studies in school. She studied at the Our Lady of Sacred Heart School from grade school until first year high school before transferring to St. Joseph's College where she finished her high school education. The schools proved to be accessible to her since both are located not far from where her family used to live at 11th Avenue, Murphy, Cubao, Quezon City. Julie Vega's final resting place at the Loyola Memorial Park in Marikina City. Not long after her high school graduation in 1985, Vega began complaining of extreme weakness and lack of sensation, particularly on her lower body. This prompted her parents to bring her to a private hospital. She was later diagnosed with a form of demyelinating disease, which was highly suspected to be either Guillain–Barré syndrome or multiple sclerosis. As Vega’s condition became worse, her parents were forced to have her confined to the Quezon Institute as they could no longer afford the increasing amount of her hospital bills. Sometime after her confinement there, she contracted bronchopneumonia, making her condition even worse than before. Vega was transferred to the Lung Center of the Philippines in Quezon City at about 5:00 p.m on May 6, 1985 where she died suddenly around 1½ hours later at the hospital's intensive care unit, just fifteen days shy of her seventeenth birthday. Her cause of death was officially listed as cardiac arrest secondary to bronchopneumonia. Vega's father Julio would himself die of lung cancer exactly six years later in the same hospital. Her untimely death left Anna Liza with an incomplete storyline and the Filipino people in total shock. After lying in state at Mount Carmel Church in Quezon City, her body was laid to rest right next to those of her father, brother and paternal grandmother at the Loyola Memorial Park in Marikina City in a funeral attended by millions of grieving fans and colleagues from Philippine showbiz. Vega's life story was most notably shown on film through The Life Story of Julie Vega, which was shown shortly after her death. Nadia Montenegro portrayed the ill-fated movie and soap opera actress and singer, Jimmy Morato and Alicia Alonzo portrayed her parents, while her brother Steve and nanny Flor appeared as themselves. That's Entertainment mainstays Jestoni Alarcon, John Regala and Hero Bautista also portrayed her brothers in the film. On television, through the October 2, 2003 episode of Maalaala Mo Kaya entitled Unan (Tagalog for Pillow) played by Angelica Panganiban and Jane Oineza as Young Julie Vega. Vega's parents were portrayed by Michael de Mesa and Rio Locsin. 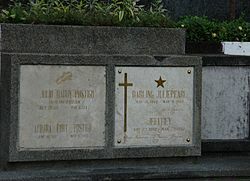 The said episode was well received by both critics and Julie Vega fans alike and is noted for its use of actual footage of Vega’s burial which featured not only fans but also celebrities like Fernando Poe, Jr., Chiquito, Nida Blanca, Herbert Bautista and best friend Janice De Belen in mourning her death. The video footage was lent to the Maalaala Mo Kaya producers for the episode by the Postigos themselves. Due to Anna Liza's success, Vega was dubbed the "Original Soap Opera Princess". Director Ruel Bayani, the producer of ABS-CBN's remake of Anna Liza, commended Vega, calling her portrayal of the role "iconic" and that she set a high standard on being a "child star". Judy Ann Santos once stated on StarStudio's special issue about Santos herself that she is a fan of Vega, and when she learned about the latter's death, she first disappeared into her room and then into the bathroom. She turned the bathroom's doorknob quietly, pushed the door shut then stood in front of the sink. She then looked at herself in the mirror and cried. Her rivalry with Janice De Belen ranks among the more famous female rivalries in Philippines' entertainment industry alongside that of Vilma Santos vs. Nora Aunor. On December 2010, Vega was posthumously awarded her own star on the Eastwood City Walk of Fame as well as another on GMA Network's "Kapuso Walk of Fame". All songs were written by Mon Del Rosario except for First Love, which was written by Alex Catedrilla. ^ "Fans continue to remember Francis M, Julie Vega" by Julliane Love de Jesus, Philippine Daily Inquirer, Nov. 2, 2013. ^ a b c d e Skipojack (October 30, 2004). Remembering 'Annaliza' at the Wayback Machine (archived November 18, 2004). Sun.Star Davao. Archived from the original on November 18, 2004. Retrieved October 20, 2012. ^ a b c d e f (in Tagalog) Maalaala Mo Kaya: Unan. Aired over ABS-CBN on October 2, 2003. ^ (in English) (in Tagalog) Lo, Ricardo F. (July 19, 1995). "Sleep tight, little darling". Weekend, p. 12. ^ "Tales of woe, death and supestitions". (May 29, 2009). Woman's Home Companion, p. 40. ^ "Caretakers of celebrities’ graves earn good living" by Aries B. Espinosa, Philippine Daily Inquirer, Nov. 1, 2012. ^ a b MMK’s Julie Vega story scores high with primetime viewers at the Wayback Machine (archived October 19, 2003) (October 11, 2003). Sun.Star Manila. Archived from the original on October 19. 2003. Retrieved June 19, 2007. ^ (in English) De Guzman, Roberto Jose (May 21, 1985). "The Short Life & Career of JULIE "ANNA LIZA" VEGA". Mr. & Ms., p. 60-61. This page was last edited on 15 January 2019, at 07:11 (UTC).